If you are concerned about ordering due to people claiming the company overcharges please read below where I tell you the truth about blueberry giant and their little giant blueberry plants. The ordering process is indeed a bit tricky since they don’t give you an order total before your order is final so the bottom line is that you need to take your time, read everything on the screen, and understand exactly what you are ordering and how much shipping and handling is for each item. If you are careful and take your time you should be like me and not have any problems whatsoever. There are a lot of people on the Internet claiming that the blueberry giant system messed up their order but that is simply not true.If the order system was flawed or scammed people I would be all over it and I would be trashing the blueberry giant company. I will say though that it is shady that they don’t give you an order total before you complete your order. However, this isn’t anything new. In fact it is common practice among As Seen On TV Products and something you have to watch out for. The fact of the matter is that the automated system does not make mistakes and if the company setup the website up to scam people it would have been shut down long before you ever made your order. The reason I know the ordering systems works correctly it because I went through the order process the amount it charged me was correct. All it takes is a little patience and reading the website as you order. 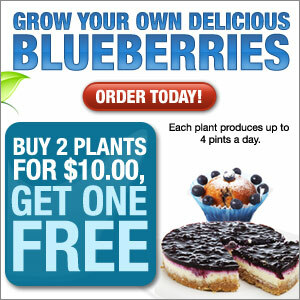 If you want 3 plants you need to order 1 set of the buy 1 get 2 free. Not 3 sets! This is clearly stated (although is smaller print) on the website. Also, on the next page where if offers you the chance to buy more of the blueberry plants at a special price you need to click on the “No” button if you do not want anymore (and if you do say yes you will be charged more for shipping and handling). At this point your first set of 3 plants is already included, something it states by saying “how many MORE sets do you want”. On each subsequent page after this it will offer you other plants such as strawberry plants, pepper plants, and tomato plants. On these pages if you select “Yes” it will cost you the amount stated for each plant or set of plants plus the shipping amount displayed (usually $4.95 per plants, and yes, that’s per plants so a set of 3 strawberry plants would cost about $15 in shipping charges alone). If you don’t want any other plants or don’t want to spend any more money be sure to select “No” on each of these pages. All I have to say is quit calling it a scam! Sure, it may be confusing and hard to understand and you even may want to blame it on the company for their check system, that’s fine but you can’t call their checkout system a scam when it charges you exactly as it states. And if you don’t like the way it doesn’t give you an order total then don’t order from them, or try to phone the company to complete your order instead. 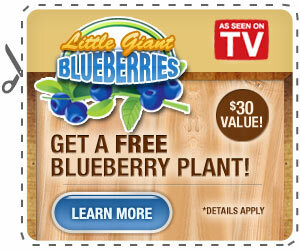 Normal processing time is about 3 weeks for these little giant blueberry plants. If you it has been more than 3 weeks you can call customer service to check the status of your order or you can check it online at http://www.customerstatus.com. If you call just know that you will probably have to wait on hold for about 5-10 minutes. Customer service hotline at 1-203-256-9547.